Scattered clouds with the possibility of an isolated thunderstorm developing this afternoon. High 74F. Winds S at 10 to 20 mph. Chance of rain 30%.. The Marine Corps League Det. 1128 donated $500 to The Tullahoma News’ Karing for Kids campaign on Monday, Dec. 3. 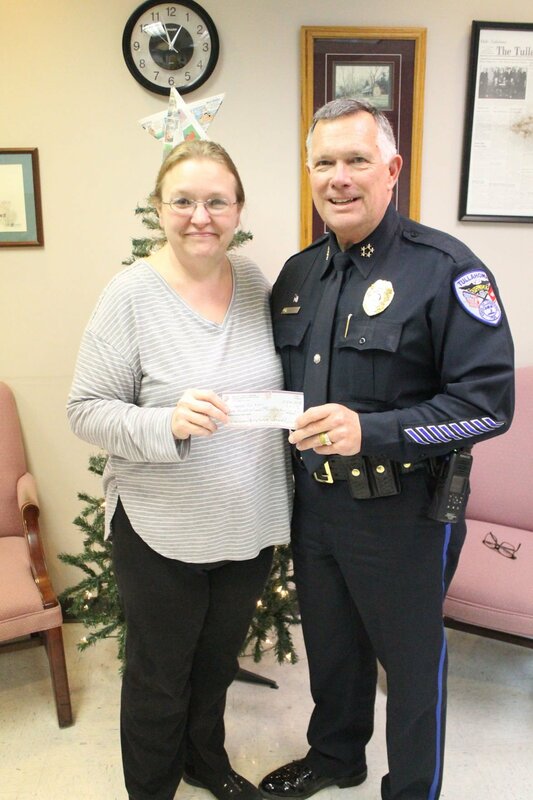 Presenting the check to Program Coordinator Debbie Wimsatt is Tullahoma Police Chief Paul Blackwell, who serves as the Commandant for Det. 1128. The final donation for the 2018 Karing for Kids campaign came from both customers and employees of Traders Bank in Tullahoma. The Traders Bank Customer and Employee donation totaled $1,105.37. Presenting the check to Karing for Kids Program Coordinator Debbie Wimsatt, second from right, are Regina Myers, Deborah Kendall, Joyce Branch and Shelby Stephens of Traders. A week after the annual shopping day, The Tullahoma News’ Karing for Kids campaign can officially close the books on another successful year. Thanks to the generous donations of the community and area businesses alike, The News was able to take 200 local children on a winter shopping spree on Monday, Dec. 3. Each of the children received $100 to spend on winter clothing before being treated to a pizza party sponsored by Coca-Cola, Papa John’s Pizza and Domino’s at Northgate Mall. The final tally of donations was just barely shy of the $20,000 goal, but program coordinator Debbie Wimsatt said that was A-OK” with her. The final amount of money raised for Tullahoma children in need stands at $19,895.66. “I call that an even year,” she said. Donations were still coming in on the designated shopping day, Wimsatt said, with $1,850 alone coming in that Monday, including one $500 donation from the Marine Corps League Detachment 1128. Wimsatt said it’s not uncommon for donations to come in the day of the shopping spree. It’s also not uncommon to have donations come in after the shopping day has occurred. Sure enough, four more donations came in after Dec. 3, totaling another $2,255.37 for the campaign coffers. Wimsatt wanted to thank all those who contributed to this year’s Karing for Kids campaign possible, from the donors to the volunteers everyone in between. Wimsatt said JCPenney’s willingness to give the Karing for Kids shoppers an extra discount enabled those who shopped there to get a few more items with the savings. Wimsatt also wanted to thank Valerie Robinson, of Tullahoma High School, for her continuous support in coordinating all the volunteer helpers. “We always have a phenomenal turnout of volunteers,” Wimsatt said, and credited that huge showing of support to Valerie’s leadership. The final list of Karing for Kids donors is listed below. As of Monday, the following individuals and/or businesses have made donations to the fund. The newest donations are in italics. Janet Garner, $50; Heart to Heart, Employees & Board Members of the Tullahoma Utilities Authority, $400; Anonymous, $25; Olivia Beavers, $100; Delaney Beavers, $100; Debbie & Ken Gamache, $150; KK’s Loan, Music & Jewelry, $100. Ruth Wells, $25; Mary O. Nisbett, $50; Marine Corps League Det. 1128, $500; Ben M. Petty, $200; Anonymous, $50; Mortgage Connection, $100. Anonymous, $1,000; Seagroves Realty Company, $100; Manchester Arts Center & The Ultimate Oldies, $50; Traders Bank Customer & Employee Donations, $1,105.37. Anonymous, $200; Brian & Candace Lynch, $100; R.E. & Joan Alexander, $100; Tut Smith, $25; Jay & Joanna Reynolds, $25; Daves-Culbertson Funeral Home, $250; Metropolitan Escrow, $500. Flatwork Wholesale Printing, $100; E.L.M. Automotive, $50; Jimmy & Donna Davenport, $50; Tennova Hospital, $500. Anonymous, $25; Wain & Carolyn Diehl, $50; Rick & Shirley Lievanos, $100; Anonymous, $35.29. Life Care Center of America, Inc. $500; Dr. Mainuddin & Tasneem Ahmed, $500; JSP, $500. Wesley heights United Methodist Church, $200; Middle TN Assoc. of Realtors, $250; Browns Tree & Stump Svc, Inc., $100; Mrs. Nelson Forrester, $100. Tullahoma Downtown Lions Club, $1,000; Rogers Group, $250. Jim & Jo Ward, $100; Fearsome Foursome, $100; Anonymous, $100; Michael & Cheryl Luttrell, $100; Bertha Bates, $25; Susan & Glen Braghetta, $50; Michael & Karen Morgan, $50; F.W. Nelms, $100; Abbie & Greg Byrom, $100. Edward & Mary Jo Daigle, $100; Renate & George Stone, $100; Mt. Zion Baptist Church Missions, $50; Anonymous, $1,000. Ross Roepke, $50; Barry & Lita Williamson, $50; Jack & Vera Harvey, $100; Kim & Ken Chittum, $100. Lisa & Daryl Adams, $60; Lauren, Lexi & Eli Lester, $50; IWS Logistics Inc., $250; Matt & Stacy Cotter, $50; Rakesh Patel – Quality Inn, $250; VFW Post 4188, $50; Dan & Fran Marcum, $100. Tennessee Apparel Corp, $100; Bruce & Olivia Evans, $50; Shorter Chapel AME Church, $35; Householder Artman, P.L.L.C., $50; The Church of Jesus Christ, $50. Anonymous, $100; Marvel Clinic, $50; Anonymous, $100; Tullahoma High School, $500; Coffee Co. Democratic Party, $70; Richard Fewell, DDS & Christopher Fogarty, DMD, PC, $100; Life Communications & Security, $50. Tullahoma Kiwanis Club, $200; Vince & Jane Eggleston, $50; Woodward’s Diamonds & Designs, $50; Credit Central, $100. Ascend Federal Credit Union, $250; Triple B Automotive, $100; Doyle & Jan Richardson, $100; Katherine Weaver & David Combs, $50; Ruth McNatt, $25. Mary Warner Beard CPA, $250; Master of Ceremonies, $250; Dr. Dinesh Gupta, $100; Cook Neon Signs, Inc., $100; Anonymous, $50; Bluebird Recovery, LLC, $250. Dr. & Mrs. John Petty, DMD, $50; Peoples Finance Co., Inc., $100; George D. Duncan, $25; Anonymous, $100; Harton Realty Company, $50; Oliver-Little-Gipson Engineering, $250. Traders Bank, $500; Nancy McWhorter, $75; Judy Nelson, $50; Badcock & More/Greg Gilliam, $100; Beverly Daniel, $35; Sherrill Pest Control, LLC, $35. Beverly Pratt, $100; Chris Holiday, $50; Glick & Woods Dentistry, $50; Medical Imaging Consult-ing, $250. Marty & Marilyn Gul-ley, $200; Frank Lamon, $100; Bill & Marga White-head, $50; David and Ro-gelia Lucas, $50; James & Treva Martin, $75. George & Donna Purcell, $100. Laura Orr, $50; Anonymous, $100; Anonymous, $100. Ellen Anderson, $25; Donna Johnson, $25; Fran Armitage, $100; Henry & McCord, $150; Howard D. Smith Rental Prop., $100; Cindy & Rusty Williamson, $75; Dr. & Mrs. Edward M. Kraft, $100. Mrs. Milner Carden, $100; Linda & Steve Rogers, $50; Dorothy Gilfillan, $50; Perry & Jean Stephens, $100; Richard & Marcia Cowan, $200; American Legion – Unit 43, $25; Jack Hice, $50; Caren C. Gabriel, $100; Edward & Janie Mirtes, $100; Jim & Mary Lou Apple, $100.